Black Friday Deal, Butcher & Banker, Lunch at Legasea and more | thirsty. Give thanks (and sip dranks) this holiday week in New York City. See what is going down. 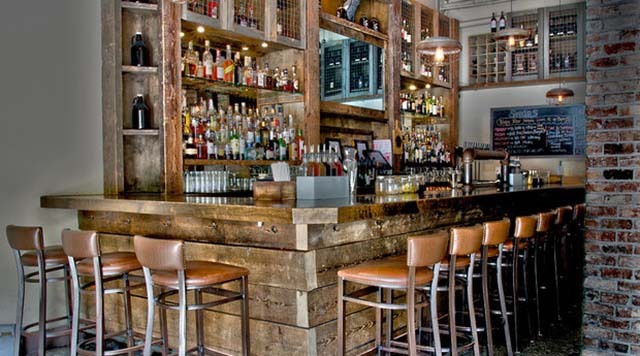 Murray Hill’s HandCraft Kitchen & Cocktails is holding a one-day-only Black Friday special. For every guest who purchases a gift card to the restaurant will receive a free gift card for half the value of the purchased card. All purchased cards must be purchased in cash. The free card is valid from January to March 2018. Note: HandCraft Kitchen & Cocktails is closed Thanksgiving Day. Open regular hours, 4:00PM to 4:00AM on Black Friday with Happy Hour from 4:00PM to 7:00PM, featuring $6 wines, prosecco, beers and well-drinks, as well as $2 off selected HandCraft cocktails. 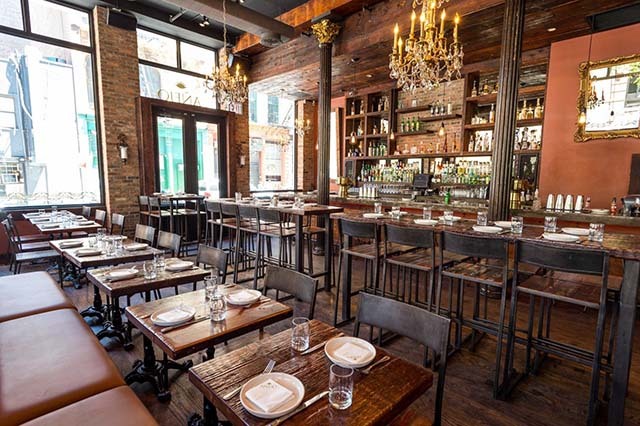 Join Añejo Tribeca for the first mezcal pairing dinner in a recurring monthly series. Starting at 6:30PM, the intimate dinner will be hosted by De Leyenda Mezcal. Expressions will be accompanied by a specially curated five-course menu created by Añejo’s Executive Chef Ricardo Camacho. Highlights include Refried Eggplant with Tomato Confit, Chives, Blood Orange Vinaigrette, Sal de Gusano seasoned chips, and Queso Oaxaca, and Salpicon de Pato, a salad of shredded duck, plums, radish, dill guaje aioli, and plantain. Enter a modern American “steakeasy” in the former Manufacturers Trust Company bank vault located underneath the New Yorker Hotel. Butcher & Banker is under the culinary leadership of Executive Chef Scott Campbell offering aged prime steaks (both as traditional and unique cuts), seasonal vegetables, and locally sourced seafood like Norwegian Salmon will be cold smoked and served with fresh horseradish crème fraiche for an appetizer or hot smoked for a main course with mushroom fondue and Hollandaise sauce. Cocktails by consulting mixologist Allen Katz, founder of New York Distilling Company, will nod to the classics and revive recipes like the original Raffles Singapore Sling. The 100 bottle wine list features 20 bottles affordably under $50. Michelin-rated chef and owner Danny Brown (Danny Brown Wine Bar & Kitchen) unveils an intimate 550-square foot charcuterie restaurant and wine bar on the Upper East Side. Taking over the former X Bar space, Charc focuses on shareable food items, offering a selection of cured meats, cheeses, plates, and sandwiches inspired by modern French cuisine. The beverage program includes varietals of red, white, rosé, and sparkling wines available by the glass or bottle, plus a reserve wine list available by the bottle. 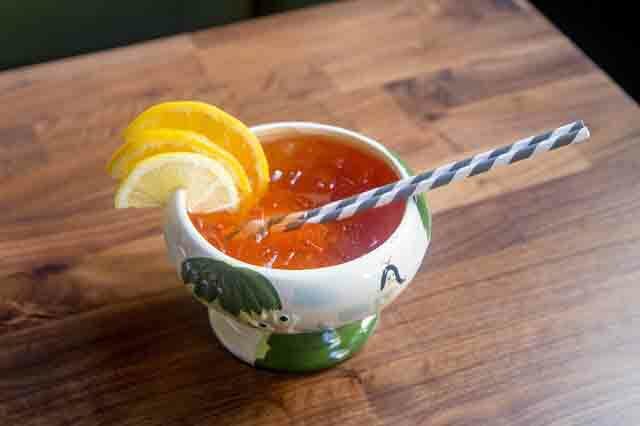 Alongside classic cocktails, the beverage menu showcases a Scorpion Bowl for two made with rum, vodka, gin, pineapple, and cherry. New York City’s favorite barbeque destination Mighty Quinn’s Barbeque opens its first ever Midtown location. 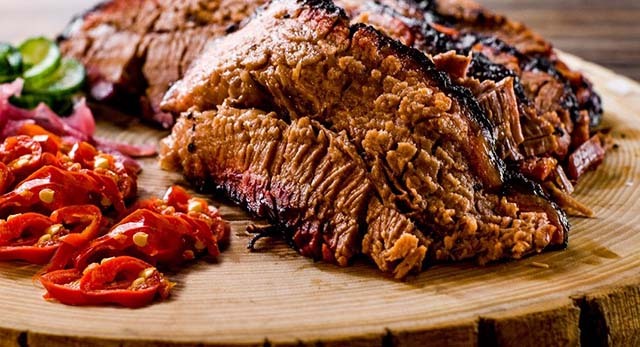 Stop in on your lunch break and devour some of Mighty Quinn’s signature slow-smoked creations like burnt ends and brisket, served naked or sandwich’d. Sling back a pint (or half gallon growler) of Mighty Quinn’s Pilsner, River Horse. Return to the office with some mac n’ cheese – Your deskmate will be hatin’. 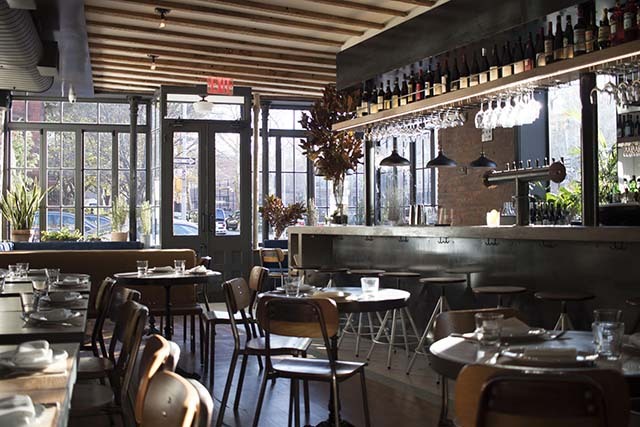 Evelina, a modern trattoria from Aurora Restaurant Group (Emporio, Aurora SoHo, Aurora Brooklyn) hits Fort Greene with Mediterranean meals. Helming the kitchen is Executive Chef Lanfranco Paliotti (Daniel, Boulud Sud, Apsleys). The menu is designed with sharing, passing, and grazing in mind, and will change daily based on what’s fresh at the market. Taste pastas with complex layers of flavor, like Veal Tongue filled cappelletti in brodo, and vibrant seafood, meat and vegetable dishes. Sip seasonal cocktails created by Simon Sebbah (Chelsea Brasserie) like Ophelia with Mizu barley shochu, Amaro Montenegro, grapefruit juice, lemon juice and shiso leaf; and Cordelia with Espadin Mezcal, banana syrup, lime juice and Coco Lopez. FYI: You can easily lose track of time over fine food and drinks here. 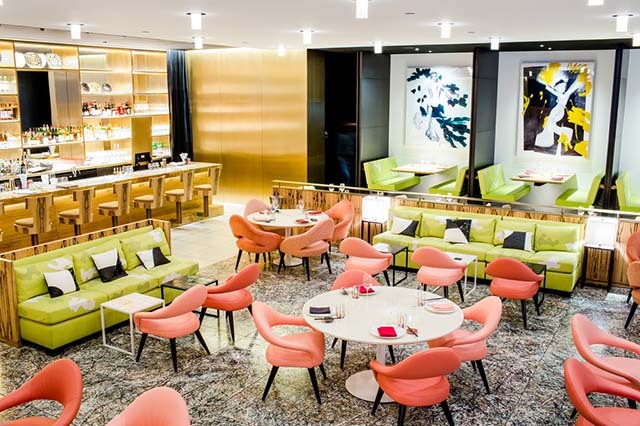 Now open in the Seagram Building, The Lobster Club is the first Asian concept from Major Food Group. The extravagant restaurant in the former Brasserie space is dressed in Picasso-inspired sculptures and drawings arranged by the world’s most sought-after retail architect, Peter Marino. Michelin-starred chef Tasuku Murakami helms the kitchen with impeccable Japanese food. The cocktail program, overseen by Major Food Group beverage director Thomas Waugh, combusts classic cocktails with Japanese ingredients and inspirations – think teas, fruits and vegetables. Barley tea is added to an Old-Fashioned; and yuzu juice and sudachi, a lime-like Japanese citrus fruit wows a Whiskey Sour. Calling all traders (and tourists) in the Herald Square, Penn Station area – Here is a playful brasserie to dine clients, conduct meetings, or simply savor a meal. Legasea is now serving up local, sustainable dishes by chefs Ralph Scamardella (TAO, LAVO) and Jason Hall (Craft, Gotham Bar & Grill) during weekday hours. Take a seat on an embossed green-leather chair and enjoy twists on classic seafood like Manhattan Clam Chowder with Littleneck clams, diced tomato and potato, and chopped bacon atop; Spicy Crab Beignets with chipotle creme fraiche and butter powder; and Lobster Thermidor Roll with crispy old bay fries and petite gem salad. The list the libations remain the same during dinner hours – That includes Foxy Moxy with Finlandia Grapefruit Vodka, yuzu citrus, and hints of pomegranate; Swipe Right with Whistle Pig Rye Whiskey, St. George Pear and caramelized pineapple; and Desert Rose with Illegal Mezcal, rose liqueur and spiced mango. Dinnertable, the tiny, trendy restaurant nestled within Garret East kicks off Saturday brunch from 11:30PM to 4:00PM with Japanese-inspired offerings from Chef Ricardo “Ricky” Arias. 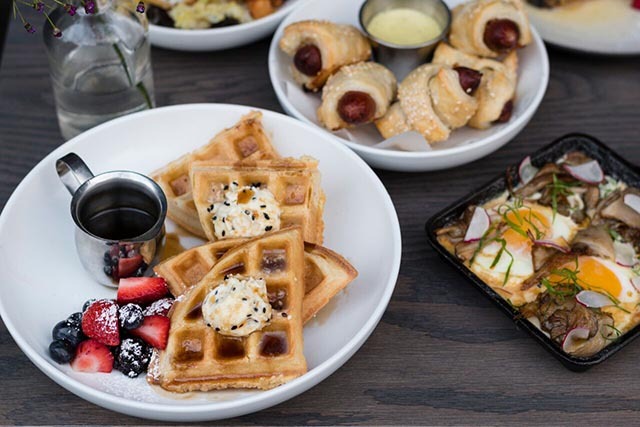 Standouts include Tres Leches French Toast with togarashi butter; Baked Eggs with mushrooms and soy vinaigrette; Beer Waffles with agave beer syrup; and Japanese Pigs in a Blanket, to share with the table. Stellar booze options range from a Spicy Carrot Bloody Mary to a House Made Coconut Milk White Russian. Dinnertable understands ‘hanger’ which is why they extended their 19-seat space to the spacious front room of The Garret East, so folks avoid long waits. Pro-Tip: The property will also throw a weekly party called Sabato Sabado from 1:00PM to 6:00PM on Saturdays with a DJ and cocktail specials. Stick around.